The container freight transportation has grown substantially in the last decade with a considerably deployment of Post-Panamax vessels in the main trade routes. In this thesis we will make an analysis in terms of costs toward the shippers of one of the main trades, Asia to East coast of the United States. To do so, we will develop some scenarios in which our final customer is situated in Chicago, Illinois and the routes to compare in terms of costs are: A) Shanghai to Chicago (through the U.S. Intermodal System) and B) Shanghai to Chicago (through the Panama Canal). The entrance gateway for the first route previously mentioned is the port of Los Angeles, and for the second route is the port of New York. The cost comparison analysis will be done with the help of the Logit Model, which calculates the probabilities or preferences of a shipper in choosing between the alternatives based on certain criteria’s as the transport costs, value of time and transit time. With the outcomes of the created scenarios we will make a sensitivity analysis based on the criteria’s previously mentioned. 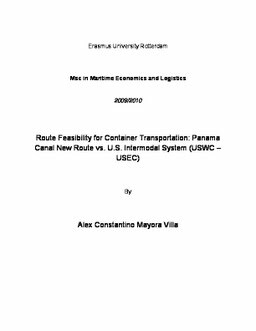 Furthermore, we will analyze the impact of the Panama Canal expansion in terms of the costs a shipper has to pay compared to the U.S. Intermodal System route.